Hello, I viewed your how to cut pattern. What was hard to see, but it looked like it was cut with both sides front and back not needing to be sewed together at top. could not tell in picture. I was curious how to get the pattern to match pattern flow on front and back. I cut separate pattern for back and front. 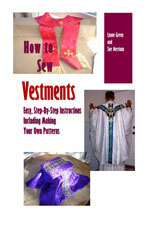 Normally, a chasuble is cut out of one single piece that has been folded twice, once length-wise and then again cross-wise. Then when you cut the chasuble, it is all one continuous piece and it doesn't need to be stitched at the top nor at the sides. Since you have cut two pieces, you will just have to be careful and match up the patterns, if possible.